This tutorial will help you to write your first Hello World Spring program.We used Maven and eclipse to develop this project. In the command prompt execute the following command to generate Maven compatible Java project named as 'SpringExample'. Maven will generate all the Java’s standard folders structure for you (besides resources folder, which you need to create it manually). This command generates those files required by the Eclipse IDE, in order for the project to be recognized as a valid Apache Maven project. Now Import the project into Eclipse IDE.Project directory is given below. Create a resources folder inside "src/main" folder. We will create Spring’s bean xml configuration file in that folder. Maven will treat all files under this “resources” folder as resources files, and copy it to output classes automatically. 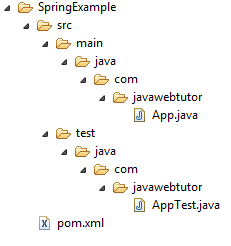 Add Spring dependency in Maven’s pom.xml file. Issue “mvn eclipse:eclipse” again, Maven will download the Spring dependency libraries automatically and put it into your Maven’s local repository. 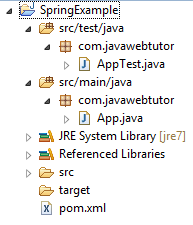 At the same time, Maven will add the downloaded libraries into Eclipse “.classpath” for dependency purpose. Create a normal Java class HelloWorld.java at “src/main/java/com/javawebtutor" package. This class is a normal java bean class.This class must be declared inside Spring bean configuration file. Create an xml file (Spring-Module.xml) at “src/main/resources/Spring-Module.xml“. This is the Spring’s bean configuration file, which declares all the available Spring beans. In the Spring-module.xml file we have configured HelloWorld class instance with unique ID.The helloBean bean is injected into the HelloWorld Bean class using the name property. Review it and make sure the folder structure as follows. Let us create the Test class having the main() method. This class uses the ApplicationContext container provided by Spring. 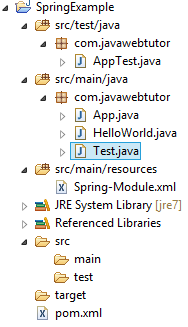 Create a java class Test inside com.javawebtutor package and add following code into this class.This class will load the Spring bean configuration file (Spring-Module.xml) and retrieve the Spring bean via getBean() method.